Located in the foothills of the San Gabriel mountains in Pasadena, JPL is NASA’s research laboratory that is managed by Caltech. JPL’s primary mission is space exploration using robotic spacecraft. This past weekend I had the good fortune of being able to attend JPL’s annual open house event, and I was pleasantly surprised by how many people were there, with lines of people waiting patiently to get into one of the 20+ exhibits. We were able to view 3D stereo images of Mar’s surface as well as watch a short 3D movie about the Earth. We were able to see how NASA missions are using JPL's infrared imaging technology to create incredible photos of distant stars and galaxies. We also saw how exoplanets are being discovered at an ever-increasing pace in an attempt to find other Earth-like planet in the cosmos capable of supporting life. (left) and Sojourner rover (center). There were several rovers on display, the most-impressive being the full-scale next-generation Mars Science Laboratory (MSL) rover. Named Curiosity, the MSL is scheduled to launch this fall and make a precision landing on Mars in August, 2012. Curiosity, with its array of scientific instruments, will be able to help assess whether or not Mars either now or at some time in its past is able to support microbial life forms. 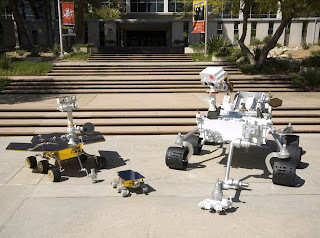 2011 is a very busy year for JPL. Besides Curiosity, in June JPL’s Aquarius satellite will be launched. Aquarius will map the salinity of the Earth’s ocean surfaces. This information will be used to improve our understanding of the oceans’ role in the water cycle by tracking how fresh water is exchanged between the atmosphere, sea ice and oceans. By measuring changes in ocean surface salinity, as well as melting ice and river runoff, Aquarius will provide new information about how freshwater moves around our planet which will help improve computer climate models as well as our understanding of worldwide ocean currents. An artistic conception of Juno orbiting Jupiter. In August, NASA will launch JPL’s Juno explorer which will, by 2016, begin orbiting Jupiter to study the planet’s composition as well as gravitational and magnetic fields, and polar magnetosphere. Juno will look for clues about how Jupiter was formed: whether it has a rocky core, how much water is present deep within the atmosphere, and what the mass distribution is within the planet. 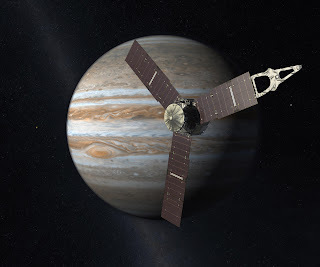 Juno will also study Jupiter’s violent storms where winds can hit speeds of 600 km/h. With all the activity going on at JPL, we can be assured of many new discoveries in the near future which I look forward to covering in more detail as they occur.